Sharp Carousel microwaves have continued to evolve with smart and new features as well as better capabilities to suit your cooking needs. These brands of microwaves are among the most popular in most modern kitchens due to their design, performance, features and cheap price. It’s important to note that, popular products mostly turn out to be the best since most customers have researched and found out more about them. To ensure that you make a perfect choice, this article will tackle some of the best Sharp Carousel microwaves available in the market to give you a chance to make a more informed decision. Multistage cooking with 10% to 100% power adjustment. Quick start express cooking. There are 6 one touch cooking functions available. LED display with clock and kitchen timer. Defrost by time or weight with removable rotating glass turn table. This 1.7 cu. ft over the range convection microwave oven is incorporated with slim fry and simple clean tray. LED cockpit display light and ceramic interior design are some great benefits. This 1.2 cu. ft and 1000 watts grill microwave oven is made of brushed stainless and dark tinted glass window. Touchpad controls with LCD and covers 3 years limited warranty. and stainless steel easy to clean interior made. Countertop power convection microwave cooks faster and deliver more easily to toast, crisp and brown your favorite foods.Scratch resistant and easy to clean with ceramic enamel interior. The Sharp Carousel 2.2 Cu. Ft 1200 Watts Microwave has a very powerful 1200 Watts cooking power which is ideal for preparing large meals fast and efficiently. The 2.2 Cu. Ft interior is very roomy and capable of holding large dinning plates and bowls. The stainless steel outer finish is very lavish and complements your kitchen décor. This microwave works very well in all settings such as warming leftovers, beverages and heating popcorn. The product comes with a one-year limited warranty, giving you confidence in your purchase. This microwave occupies most of your counter space, leaving you with a very limited space to fit other kitchen accessories. The motor is very loud and noisy when operating. Some customers have complained about the customer service stating that they usually take long to answer. Although there are some minor cons which come with this unit, they’re not enough to outweigh the pros. The Sharp Carousel 2.2 Cu. 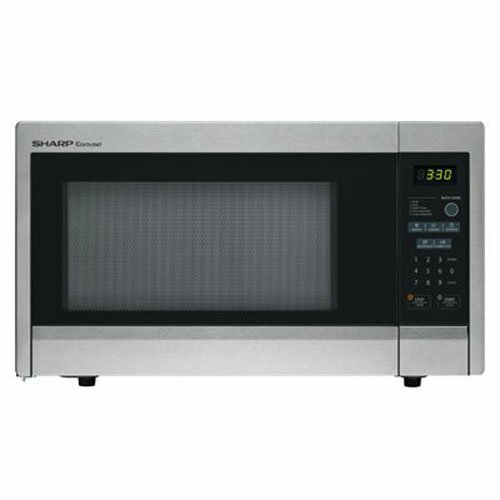 Ft 1200 Watts Microwave comes with very smart, easy to use features which have really pushed most customers to prefer purchasing this unit over its competitors. Liked the review? We found the best cool place to buy this microwave is Amazon Marketplace. Here is the discount link with maximum saving. The Sharp R-331ZS Microwave oven is a countertop microwave which comes with new and brilliant features enough to elevate your kitchen experience. Available in a gray/black outer finish, this microwave features; 11-power levels, a 1000 Watts cooking power, a 1.1 Cu. Ft interior, a large 11.25 glass turntable, 5-auto cook programs and LED digital controls. With a child safety lock, a time/weight defrost function, a weight of 29.3 pounds and dimensions of 14.9×20.3×12 inches, this is the best kitchen unit for people looking for quality. With a powerful 1000 Watts cooking power, this Sharp microwave is able to cook food evenly and thoroughly within a very short time. It has many auto cook features which defrost, warm and heat up a wide variety of recipes. The size is compact and moderate making it ideal for small kitchen use. It has a lavish stainless steel combination of gray/black which complements most kitchen decor. The interior lighting doesn’t go on when you open the door. You therefore need to place this microwave in a well lit area to monitor the cooking process. The motor is quite loud, especially when operating on the higher settings. The interior plastic used to shield the glass on the door is of poor quality. It reacts with the heat when cooking is in progress and distorts a little. A lot can be said about this microwave oven, but the fact is that it keeps the job done within a very short time. There are many features and smart technologies which come with this unit and looking at things, it’s evident that with a 3.8 star rating from 267 verified customers, the Sharp R-331ZS Microwave oven is the best in the arena. Liked the review? We found the best place to buy this microwave is Amazon Marketplace. Here is the discount link with maximum saving. The Sharp R559YW Carousel Sensor Microwave Oven is a well designed kitchen appliance with a stunning combination of style and performance. Powered with an 1100 Watts cooking power, this microwave oven features a 1.8 Cu. Ft interior, a touch control panel with LED display, child safety features, 5-sensor cook features (frozen vegetables, fish/seafood, frozen entree, baked potatoes and fresh vegetables), 3-auto weight defrost settings (meat, poultry and fish) and 4-softening options for preparing butter, ice-cream and chocolate. Available with a large 15” turntable, the Sharp R559YW Carousel Sensor Microwave Oven has a weight of 38.1 pounds and dimensions of 18.1×23.2×13.3 inches. The lettering on the buttons on the control panel is very easy to read through. The motor is very silent as compared to most microwaves on the market. It has an interior lighting which remains on when the door is opened. The 1100 Watts cooking power cooks your food fast and evenly. The door has a push button which makes it very easy to open eliminating the hassles of pulling and pushing the doors as found in most units. The writings on the keypad are very faint and almost impossible to read through. Some customers have complained about the beeping stating that it’s very loud and goes on and on until you press the stop button. Although it’s described to have a stainless steel outer casing, the truth is that areas around the window and the keypad are the only ones which are made of stainless steel. The rest of the unit is painted. After a thorough review of the Sharp R559YW Carousel Sensor Microwave Oven, it’s clear that this unit is a real beast with the capacity to cook, warm, heat and defrost a wide array of recipes within a short time. With a large interior, powerful motor and modernized features, this is the best unit to consider if you have a large family or if you’re looking to entertain your guests. After reviewing three of the best microwaves from Sharp, the Sharp Carousel 2.2 Cu. Ft 1200 Watts Microwave was the leading in the list. This microwave is not only powerful but is also jam-packed with smart new features which have elevated its name at the top of the ladder. Second in the category is the Sharp R-331ZS Microwave oven, which is a countertop model available with a black/gray finish. This unit has brilliant features which include; 11-power levels, a 1000 Watts cooking power, a 1.1 Cu. Ft interior, a large 11.25 glass turntable, 5-auto cook programs and LED digital controls. Last in this category, we have the Sharp R559YW Carousel Sensor Microwave Oven which comes with a mix of style and performance. Powered with an 1100 Watts cooking power, this microwave oven features a 1.8 Cu. Ft interior, a touch control panel with LED display, child safety features, 5-sensor cook features, 3-auto weight defrost settings and 4-softening options.